This week has been a hectic one in the office – as it always is before a fieldwork week! The packing pile is growing ever higher and the plans for next week are falling into place, so far so good! This time we are heading off to the Isle of Wight! There are loads of things going on during the week and if you would like to get involved in any of our events, please don’t hesitate to contact us on forgottenwrecks@maritimearchaeologytrust.org. We will mostly be based in the Shipwreck Centre and Maritime Museum at Arreton Barns Craft Village during the week. We are also honored to be temporarily hosting the SS Mendi ship’s bell, and it will be on display for the public on the 25th to 29th September. The museum is open daily from 10 am to 5pm, and we also have an extra evening event on the Thursday that is definitely worth coming along for – more details below. Come along to find out more about the work of the Maritime Archaeology Trust and how you can be involved. 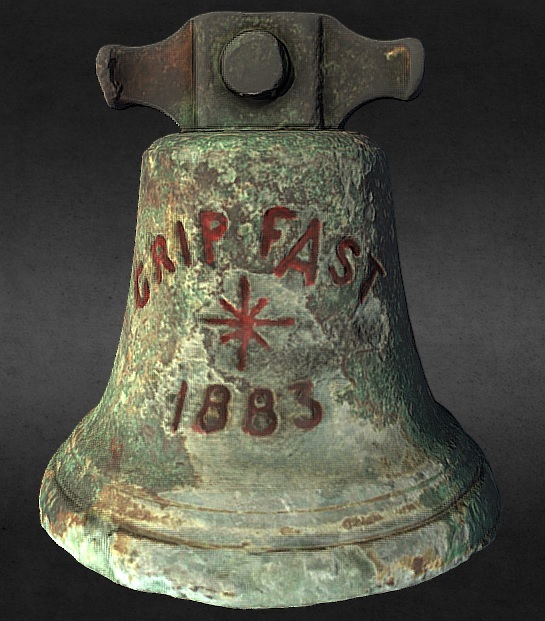 The evening will include short presentations about the project and the work of the Trust and an opportunity to see the Shipwreck Centre’s amazing collection – including the SS Mendi ship’s bell!. Nibbles and wine will be provided. The event is free, but please let us know you are coming by booking your place here. Yaverland Battery located at SZ 6152 8529. 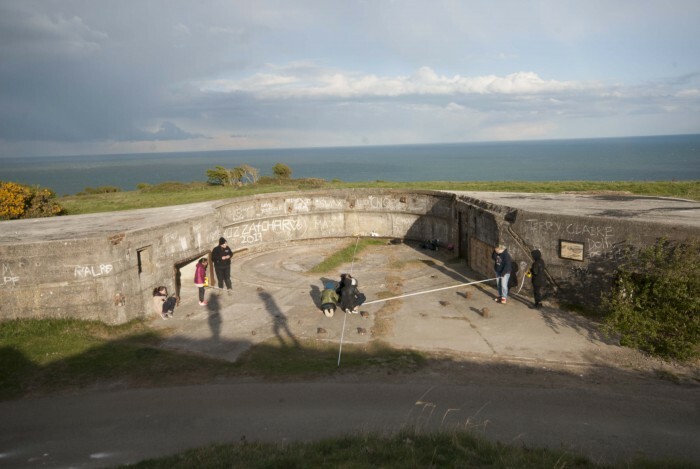 The battery opened in 1864. By 1902 the original rifle muzzle-loading weapons had been replaced by three 6-inch breech-loading Mk. VII guns, two of which were in use during the First World War. From 1906 it operated as an examination battery. #MuseumWeek2017: Theme of the day, TRAVEL! Museum Week is an international online event that is running from 19th to 25th June 2017. Organised in collaboration with UNESCO, the Museum Week is a chance for heritage institutions across the world to share and talk about our passion for heritage with the public through social media. This year we are celebrating equality by dedicating the Museum Week to all women in the world. The Maritime Archaeology Trust will be sharing with you our take on Museum Week. 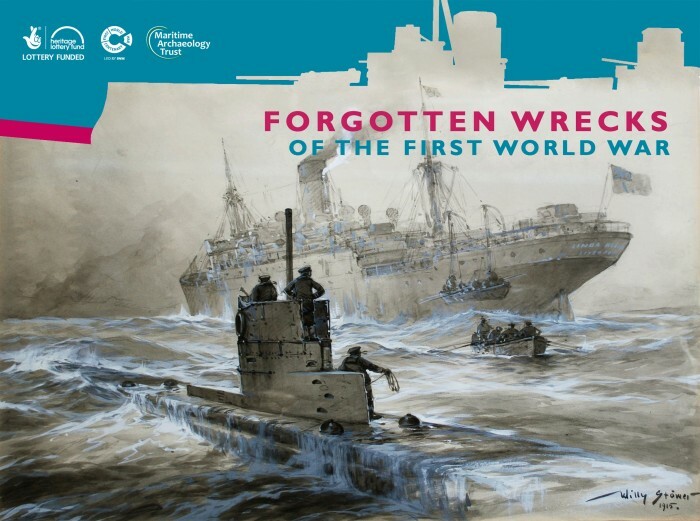 In collaboration with the Shipwreck Centre and Maritime Museum on the Isle of Wight we will be looking through their collections and bring you artefacts and histories that are linked in with the theme of the day. Saturday’s theme for the week is TRAVEL! Artefacts recovered from shipwrecks have a natural connection with travel. Either they have been on board the ship and travelled to the same destinations or they originate from the destinations visited by the ship. 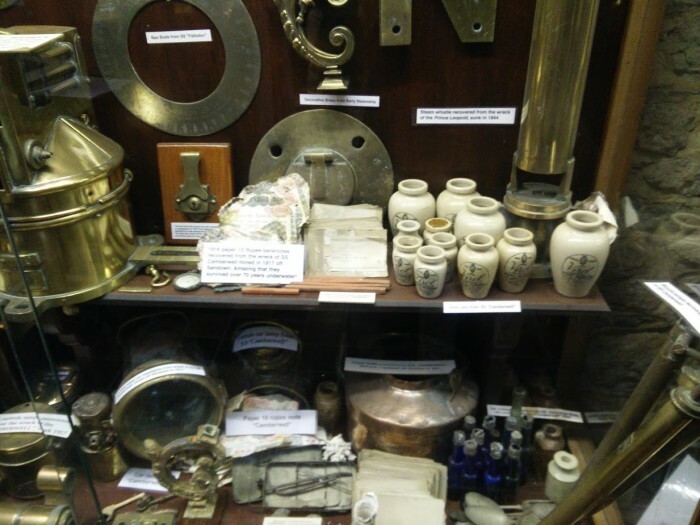 The Shipwreck Centre’s collection has numerous items that have a connection to maritime travel. Some are extremely fascinating to the viewer, such as the “Feejee mermaid” that was discussed in a previous blog post. 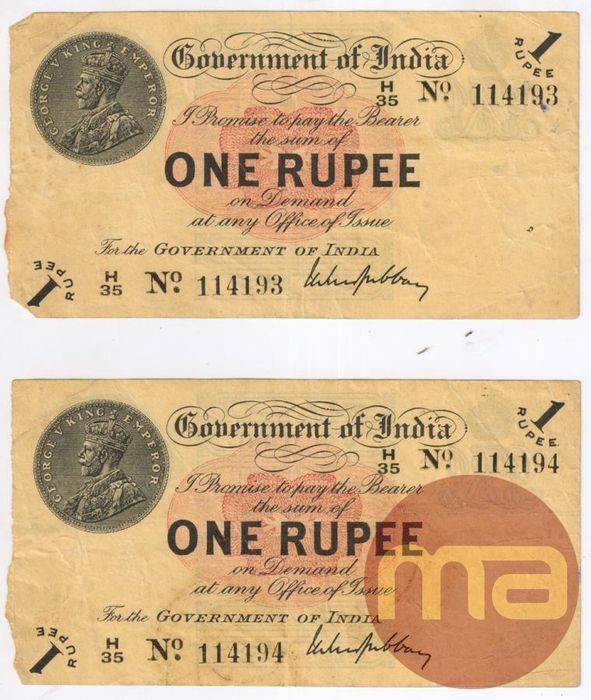 On the wreck of the SS Camberwell, divers found Indian rupee banknotes which were still recognisable. Remarkably these had survived for 70 years before they were brought back to the surface. The SS Camberwell sunk on the 18th May 1917 when it struck a mine and sunk 6 miles SE of Dunnose Head on the Isle of Wight. Sadly seven people perished with the sinking of the ship, all with Indian heritage. India was officially recognised as a British colony in 1858 when the Crown took control of India from the East Indian Trading Company. Lascars, or Indian sailors had already been employed by the EITC as sailors in the 17th century. With the Royal Navy’s demand for sailors during wars the number of Indian sailors quickly rose. By 1917 the number of Indian sailors on British registered vessels were up to over 51 000. The rupees found on the SS Camberwell tell the journey of the people connected with the ship. Like the mermaid and the HMS Victory’s logbook mentioned earlier this week, the bank notes have travelled far before ending up on display at the Shipwreck Centre on the Isle of Wight. Just like the people on board the SS Camberwell before it sank in 1917. #MuseumWeek2017: Theme of the day, BOOKS! The Friday theme during Museum Week is BOOKS! Or in our case, more accurately logbooks! 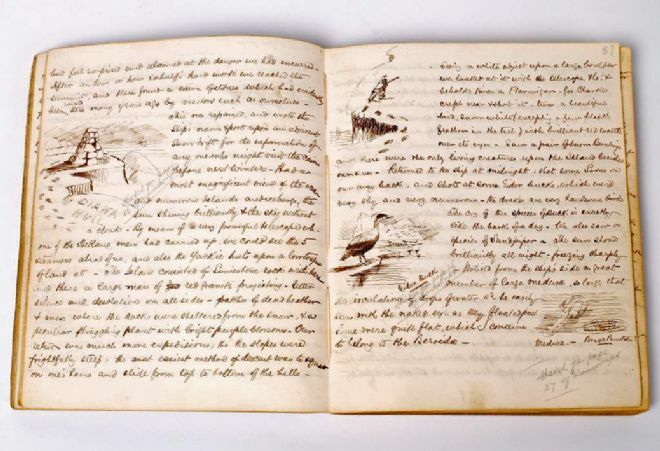 A logbook or ship’s log is a record of important events that happened during the ship’s journey. This also includes management, operation and navigation of the ship. The logbook was a key part of navigating a ship. Navigation is largely based on defining the latitude and longitude of the ship’s location. The longitude is the more difficult one to determine, as it requires the sailor to know the local time to determine what time zone they were travelling through, and as such determine their location by combining the ship’s latitude position. Medieval sailors were unable to determine the latitude-longitude completely accurately, due to the technology that was available to them at the time. As such the sailors heavily relied on the dead reckoning system. The dead reckoning principle works the following way. The sailor would start by taking a known or assumed position of the ship. Then the heading and the speed of the ship from this location would be measured, as well as the speed of the ocean currents, the leeward (downwind) drift, and how long the ship spent at each heading. Based on this information, the navigator could determine the course of the ship and how far the ship had travelled. This was noted down in the logbook, which was then used to as a reference to check the accuracy of the predicted dead reckoning. A ship’s logbook holds a huge wealth of material for maritime archaeologists. Finding a ship’s logbook is like finding a gold mine. We can retrace the journey of the ship from the logbook and compare that to any remains we may have found. This is valuable when trying to determine the identity of a wreck for example. It also gives us a great insight into what life on board was like. 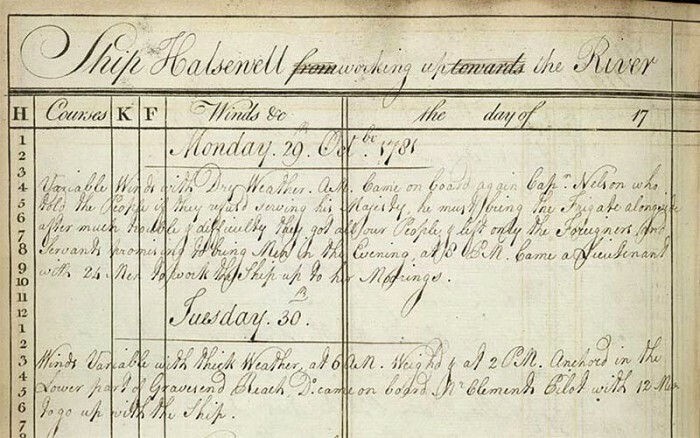 For a great example is an extract from the logbook of the Halsewell. The Halsewell was a merchant ship based in the East India Company. There is a record in their logbook from 19th October 1781, where Lord Nelson (then Captain) recruits experienced sailors for the Navy, leaving the ship with only “foreigners and servants”. The Shipwreck Centre also holds logbooks in their collection. 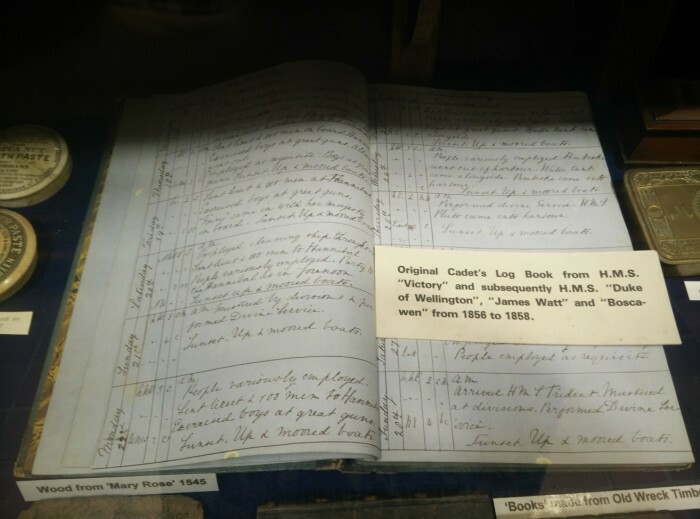 An example can be seen here of the logbook from the HMS Victory which subsequently became the logbook of the HMS Duke of Wellington, the ship that replaced the HMS Victory as the Port Admiral flagship at Portsmouth between 1869 and 1891 (McKay 1987:9). Next time you visit the Shipwreck Centre and Maritime Museum on the Isle of Wight, try to spot the logbook which is on display next to old toothpaste and wood from the Mary Rose! #MuseumWeek2017: Theme of the day, STORIES! Museum Week is an international online event that is running from 19th to 25th June 2017. Organised in collaboration with UNESCO, the Museum Week is a chance for heritage institions across the world to share and talk about our passion for heritage with the public through social media. This year we are celebrating equality by dedicating the Museum Week to all women in the world. The Thursday theme is, STORIES! We have a special one for you today! There are probably very few people in the world who haven’t heard about the myth of mermaids. 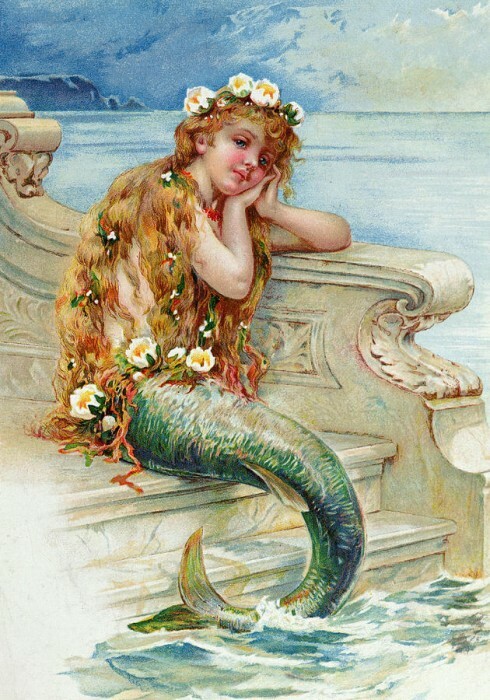 But did you know that in the Victorian period “real” mermaids were sold as collectables? The myths of the mermaids and mermen date back as far as 1000 BC. The Assyrian legends told of a queen who accidentally killed her lover. In despair she threw herself into the sea to transform into a fish but the water only transformed half of her body and as such she became half fish and half human. Stories of similar creatures can be found across the world. In Africa the legend of Mami Wata, a powerful water spirit, sometimes takes the shape of a mermaid. She is not too dissimilar from the legends of European mermaids (think HC Andersen’s “The Little Mermaid”). Interestingly the legend of the mermaid Lasirn in the Caribbean has resemblance to both the African and European legends. We also find records of mermaid stories and sightings from the American, Inuit, Indonesian, Australian and Japanese cultures. The collectable mermaid hoax has been around for centuries. However, the most famous version was created by an American conman, P.T. Barnum, in 1842. Known as the “Feejee mermaid”, it was said that this mermaid corpse had been caught near the Fiji islands in the South Pacific. In actual fact the head of the “mermaid” was of a monkey while the tail was from a fish. Put together and dried out it does make for a quite convincing deep-water creature. During the Victorian period people would buy these “mermaids” as collectables from their trips. Especially in Japan this became a very popular thing to sell to the tourists. The “Feejee mermaid” is now often referred to as the Japanese monkey-fish. 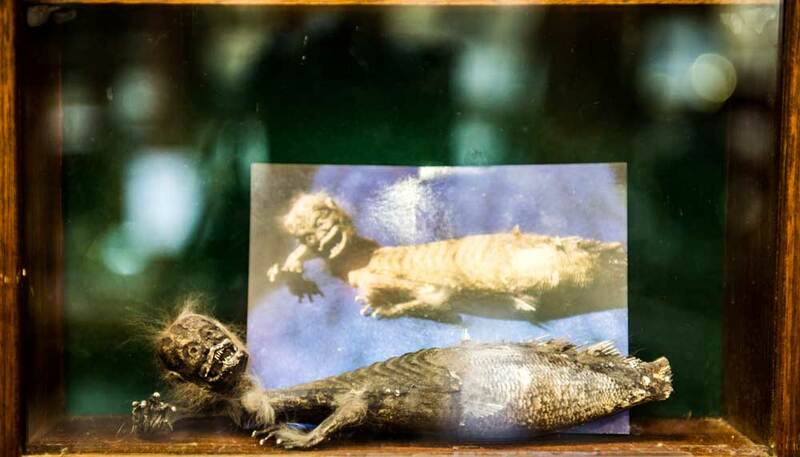 When you visit the Shipwreck Centre and Maritime Museum on the Isle of Wight be sure to check out the “Feejee mermaid” we have in our collection! #MuseumWeek2017: Theme of the day, MUSIC! Wednesday’s Museum Week theme is MUSIC! Music has always been an important aspect in seafaring. Musical instruments were used by the crew for entertainment, but also for keeping pace when rowing and calling for action. 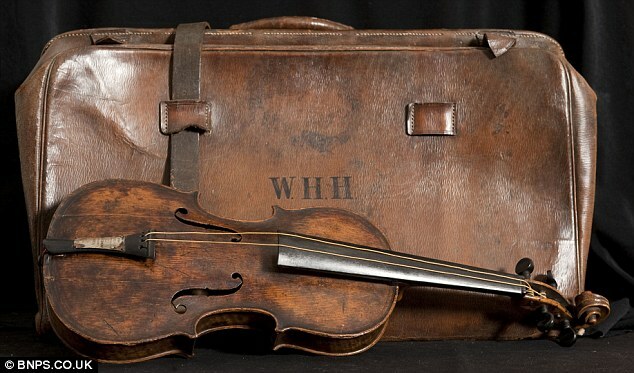 When excavating the Mary Rose archaeologist discovered a number of musical instruments in the crew belongings on the orlop deck. These included tabor pipes, a tabor/drum and the earliest example of a shawm which is an early form of oboe. Famously during the sinking of the Titanic, records state that the band was playing on deck while the ship was sinking to help keep the passengers calm. Although it is not a musical instrument as such, the Bosun’s whistle has a long history in the seafaring world. For example, it is thought that the Roman’s used a type of whistle to keep the rowers in pace on their war ships. The whistle is commonly used in the Navy. It is used to attract the attention of the crew before handing out orders. Different calls have different meanings and sometimes just the whistle call itself is enough to deliver the message, such as the “Carry On” command. Of course, the use of musical instruments was not always necessary in order to make music. Sea shantys were commonly sung by the crew while working on board the ship. It helped keep the crew’s morale up while completing tedious tasks. #MuseumWeek2017: Theme of the day, SPORTS! The Tuesday theme for the week is SPORTS! 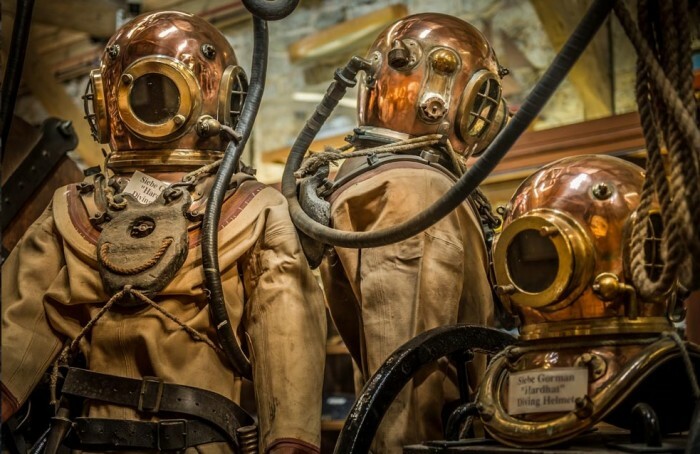 Did you know that at the Shipwreck Centre we hold a collection of antique diving gear? 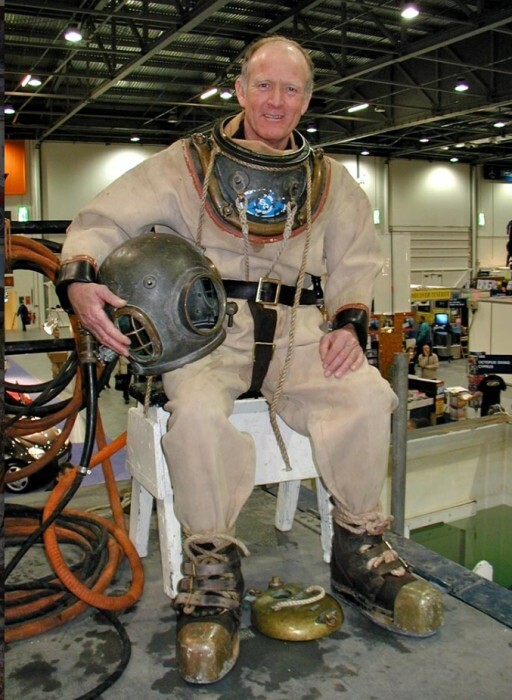 Augustus Siebe, who is a German born inventor, is credited as the first person to design the closed diving suit, i.e. full suit and helmet in one. The design came about after he was contacted by the Deane brothers who wanted Siebe to come up with a new helmet design to replace their own. The Deane brothers are well-known in maritime history. They were the first people to discover the wreck of the Mary Rose among other things. The first design of the Siebe diving suit came about in 1839. 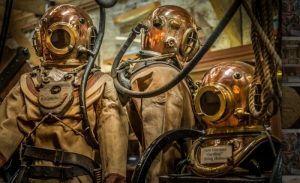 Still a century after its creation – Siebe’s diving suit was still used all over the world. 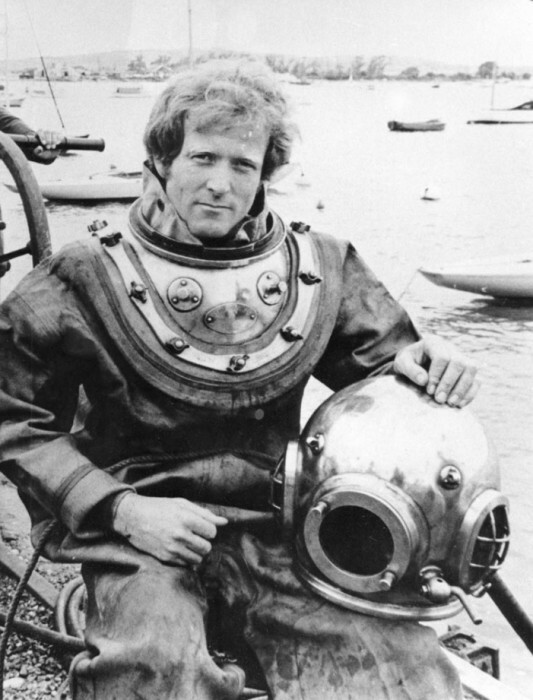 Martin Woodward, the founder of the Shipwreck Centre and Maritime Museum on the Isle of Wight, proved that the antique diving suit design can still be used when he tried it out in the 70s. The Shipwreck Centre and Maritime Museum is a treasure hub of knowledge about the ocean’s sunken secrets, primarily around the Isle of Wight. 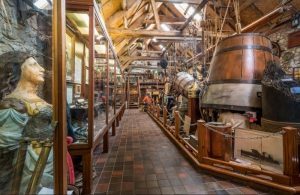 Located at Arreton Barns Craft Village on the island, the museum attracts a visitor pool of all tastes and ages. 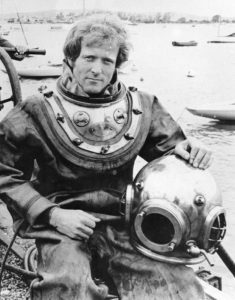 The collection held by the museum has almost solely been recovered and collected by Martin Woodward, a professional diver for 50 years. His passion for shipwrecks and maritime history has enthralled the public ever since he first opened his collection in 1978. The Shipwreck Centre holds an intriguing collection of curiosities. 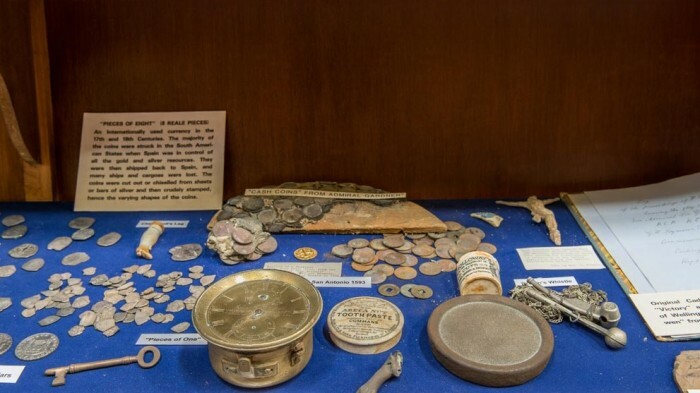 There is everything from antique diving equipment, ship’s navigational instruments, and artefacts recovered from famous Royal Navy vessels, to pieces of eight and even a real “mermaid”! Additionally there is also an exhibition dedicated the history and service of Lifeboats, with the focus on the Bembridge Lifeboat Station. On the 11th April 2017, the Maritime Archaeology Trust took over the management of the Shipwreck Museum from Mr Woodward (blog post). Our plans for the future are to build on the amazing collection that already exists. We are looking to expand the museum for more displays, continuously research the artefacts and the stories that are connected with them, and also adding the latest high tech visualisation technology to display the collection in a modern light. So in honour of the International Museum Day 2017 we would like to highlight this gem of a museum and hope that you will join us in making it even greater for the future. 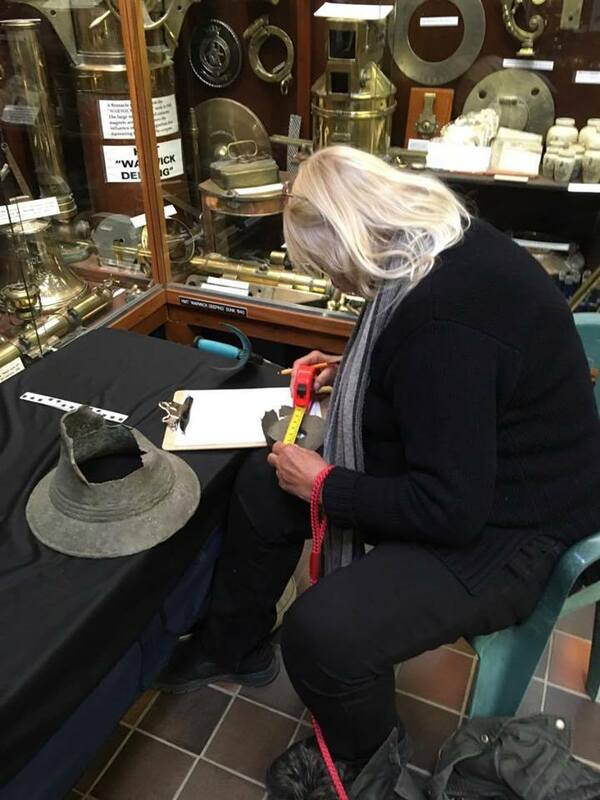 If you be interested in volunteering and being part of shaping the museum for the future please contact: curator[at]maritimearchaeologytrust.org. Toolmakers, Boat Builders, Fishermen and Coastal Traders on the Isle Of Wight - 8000 years ago! The Isle Of Wight is the home of some of the very first Britons 8000 years ago. The underwater excavations at Bouldnor Cliff are proving this. But, we need sponsorship to help us carry on further excavations and place the island at the centre of Britain's ancient history.